Homemade ginger paste takes only a few minutes to make but can help you save time when you are in hurry. Here we give you two ways to make homemade ginger paste. Choose the method you want. The first method keeps ginger paste good in the fridge for 3-4 days. The second one keeps for longer than a month in the fridge. I usually make ginger paste with the second method as that keeps longer. If you are planning to use ginger within 3-4 days, use the first method. If you plan to keep the paste longer, use the second method. With both the methods, we use salt. While cooking any dish where you use this ginger paste, adjust the salt amount in your dish keeping in mind the salt that you have already added while making the paste. The steps for cleaning and preparing ginger for making paste are same for both the methods. So follow those steps first. Use fresh ginger root. Make paste within a day or two after getting it from the market. Buying ginger and steps for preparing fresh ginger before making paste. Wash again after peeling if needed. Dry well on a kitchen towel. Chop ginger roughly in pieces / slices. Do not cut too thick pieces. There is a possibility of them not getting ground to fine paste. Ingredients for making ginger paste method 1 to use within 3-4 days. 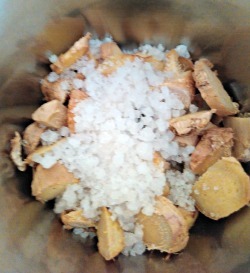 To make ginger paste with method one. Put ginger pieces in the blender along with salt. Blend for a few seconds. 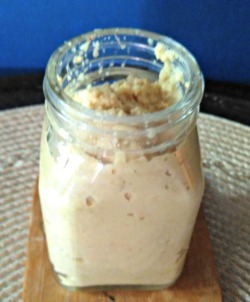 The ginger would have cut in small pieces and may be coating the sides of the jar. Scrape the sides. Add 1 tbsp water. Blend again till the paste is as fine as you want. Stop, scrape and mix in between if needed before blending again. As the ginger contains some water, you may not need to add more than a tbsp of water. But if needed, you may add another tablespoon of water. Do not make the paste too watery. Store this ready ginger paste in a jar and keep it in the fridge. Use this ginger paste as and when needed within the next 3-4 days. The ginger paste made with this second method will not splutter when you add it to the oil while cooking. Put ginger pieces in the blender. Add some salt. I am using rock salt. 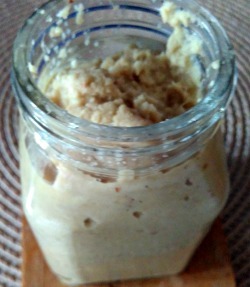 The ginger would have cut in small pieces and may be coating the sides of the jar. Scrape the sides of the mixer jar. Add 1 tbsp olive oil or any vegetable oil. Blend again till the paste is as fine as you want. Stop, scrape and mix in between if needed before blending again. As the ginger contains some water, you may not need to add more than a tbsp of oil. But if needed, you may add another tablespoon of oil or vinegar. Do not make the paste too liquid. Store this ready ginger paste in a jar and keep it in the fridge. It will keep for more than a month. Use this ginger paste as and when needed. 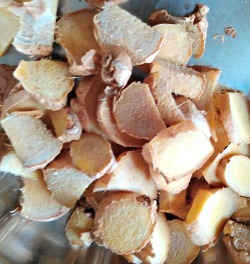 Use fresh ginger for making paste. Peeling ginger before making a paste is optional. I do not always peel the skin. I usually add olive oil. You may add any vegetable oil you usually use. 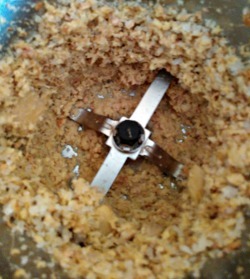 If you have time, grind ginger with salt and attend to some other work for 10-15 minutes before grinding completely to paste. This will release the moisture in the ginger and grinding to paste will be easier and you will not need to add additional liquid.